This is a great book for the beginner dog owner as well as the seasoned owner that may need to be reminded that dog training is not rocket science. What Color is Your Dog? has nothing to do with the fact that you dog is white w/ black spots, black w/ a white patch, Brindle, Brown or even Tri-colored! 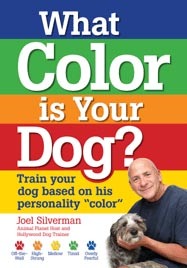 Joel Silverman’s What Color is Your Dog? teaches you the importance of establishing a solid bond between you and the dog before any major training begins. What Color is Your Dog? teaches how to evaluate and classify your dog’s personality into one of five different categories and then shows you the proper method of training based on that personality. It goes thru the importance of using the right training tools and shows you how to use them. It shows you how to communicate with your dog without shouting, hitting, or jerking on the leash. In fact, he shows that you don’t even need to raise your voice or get upset when your dog does something wrong! He also deals with overcoming common obsticles that arise during a training session. Joel has been a professional trainer for 30+ years. He trained Sea Lions, Dolphins, and Killer Whales as well as other marine mammals before becoming a dog and cat trainer for the movie and advertising industry. Without realizing it, you’ve seen his work in many movies and commercials for over 20 years. This work also includes all of the Iams commercials aired in the past few years. He has been the host of Animal Planet’s “Good Dog U” (a staple of dog training for the past ten years). He also received the “Trainer Of the Year” award in 2008. This is a “must have” book for any dog owner!